The newly negotiated nuclear agreement with Iran still has to be reviewed by Congress, but it offers the United States and its allies the historic opportunity to restrain Tehran’s nuclear program and prevent the country from acquiring a nuclear weapon for at least the next decade. This agreement is vital to U.S. national security, but it is important to recognize that it has a specific purpose: reining in Iran’s nuclear program. It does not address the rest of Iran’s malicious international behavior simply because it is not intended to do so. Accordingly, the United States and its close partners in the Middle East and Europe should take active steps to crack down on Iran’s ability to foment chaos in the region—and the Obama administration should lead the way. The nuclear agreement was a necessary step to most effectively block Iran’s pathways to a nuclear weapon, but it is unlikely to change Iran’s bad behavior—which in turn is causing great apprehension among the United States’ allies in the region. By working together with a coherent strategy to counter Iranian subversion, the United States and its partners are capable of meeting this challenge. Iran’s subversion and proxy network is vast, stretching geographically from Latin America to Afghanistan. This network conducts terrorism, organizes and supports sectarian militias, and generally foments instability from Argentina to Iraq. These activities do not cost Tehran much financially—support for both Hezbollah and the Assad regime in Syria is estimated to have cost Iran less than $10 billion last year—but they are sufficient to sow chaos in the Middle East and beyond. Tehran has three main organizations through which it spreads regional instability and sectarian strife: the Islamic Revolutionary Guard Corps—Quds Force, or IRGC-QF; the Iranian Ministry of Intelligence and Security; and Lebanese Hezbollah. Though the U.S. State Department identifies the Quds Force as “the regime’s primary mechanism for cultivating and supporting terrorists abroad,” all three organizations work together to further Iranian interests in the Middle East. Tehran’s fingerprints can be seen on virtually all of the region’s conflicts. It supplies missiles and rockets to Hezbollah in Lebanon and Hamas in the Palestinian Territories, which are then fired at Israel. Iran supplies the Assad regime with money, Iranian troops, and a supply of foreign Shia militiamen and backs sectarian militias in Iraq that undermine the authority of the government in Baghdad. More recently, Tehran has been accused of supplying arms to the Houthi rebels who have seized control of much of Yemen. In all, Iran has created an impressive network to foment instability across the Middle East. Tehran backs militant groups from Palestine to Iraq and Lebanon to Yemen with arms, training, and funds. This support invariably makes these militant groups more effective and worsens existing conflicts—often by sharpening their sectarian edges. Countering this web of Iranian proxies—and the chaos it creates—remains a core American interest in the Middle East. There are no silver bullets to bring down Iran’s network of regional instability. Countering Iran’s malignant regional behavior will instead require a series of actions from both the United States and its Middle Eastern partners. Policymakers should be modest in their expectations: The overall goal of the United States and its regional partners should be to degrade and disrupt Iran’s effort to destabilize the Middle East rather than defeat it outright. Steps the United States and its regional partners can take to counter Iranian meddling in the Middle East include the following recommendations. In April, the U.N. Security Council imposed an arms embargo against the Iranian-backed Houthi rebels in Yemen, giving international legitimacy to efforts by the United States and the Saudi-led coalition to interdict Iranian vessels suspected of ferrying arms to Yemen. Similar arms embargoes could be imposed on other Iranian proxies such as Hezbollah, Hamas, and the Shia militias fighting on behalf of the Assad regime. Should the U.N. Security Council pass arms embargoes against Iranian proxies, the United States and its regional partners would have the authority and legitimacy to intercept suspected Iranian arms shipments before they reach their destinations. It may prove impossible for the U.N. Security Council to approve all of these embargoes, but the United States could also build a multinational coalition effort to try to interdict Iranian weapons transfers. Following the May 2015 Camp David summit between the United States and Gulf Cooperation Council, or GCC, states, the White House published an annex to the summit’s joint statement outlining areas of enhanced security cooperation between the United States and the GCC. Many of these areas of cooperation are relevant to efforts to counter Iran’s destructive regional influence. U.S. regional partners have already been the victims of Iranian cyberattacks, most notably a 2012 hack against Saudi Aramco, the Saudi state oil company. The United States already has cybersecurity advisors embedded in relevant Saudi government offices. The summit statement annex calls on the United States to provide GCC states with additional cybersecurity aid. The United States should push to institutionalize the cybersecurity arrangements outlined in the annex, with a view toward protecting regional networks against Iranian cyberattacks. This cybersecurity forum should also be extended to include regional partners beyond the GCC, such as Jordan. At Camp David, the GCC states agreed to deepen their cooperation on ballistic missile defense, and the United States agreed to provide technical assistance for the creation of a Gulf ballistic missile early warning system. The United States should jump-start this process and accelerate improvements to the GCC’s ballistic missile defense interoperability by expanding sales of the Terminal High Altitude Area Defense, or THAAD, missile defense system beyond the United Arab Emirates and Oman. An integrated Gulf missile defense system would also benefit from the Integrated Battle Command System, or IBCS, which will integrate the separate elements of the missile defense system and increase their effectiveness. A robust Gulf missile defense system can both hedge against the Iranian ballistic missile threat and serve as a symbol of Gulf political unity. The GCC states also agreed to take greater steps to share information and interdict illicit arms smuggling, while the United States agreed to provide training and aid to the GCC on maritime security issues. These steps should be taken as soon as possible, with a primary focus on prohibiting illicit Iranian arms shipments to proxies. 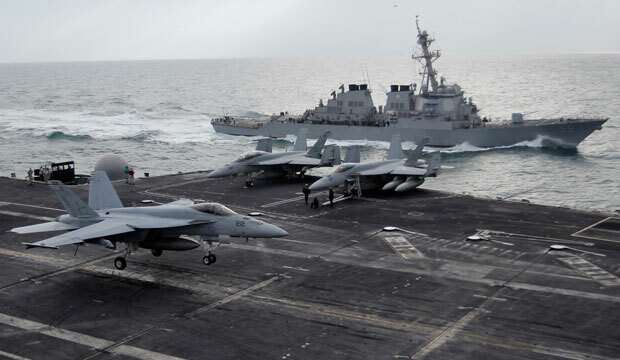 Other countries—both GCC neighbors and long-time U.S. allies from outside the region—should be integrated into efforts to increase GCC maritime security capabilities. The United States pledged to examine options to increase special operations training with its GCC partners. Many GCC states are building their special operations capabilities from scratch, so a concerted effort to train and equip these forces in GCC countries will be required. But this effort should avoid the creation of a GCC equivalent to the Quds Force. The last thing the Middle East needs is another state-sponsored network of highly sectarian proxy forces. Instead, American efforts should concentrate on practical skills—such as conducting raids similar to the May 2015 operation that killed a key Islamic State of Iraq and al-Sham, or ISIS, financier—and interoperability with American special operations forces. Throughout the negotiations process with Iran, Israel and the United States have missed opportunities to establish a post-agreement strategic framework to counter Iran’s regional influence because of the friction caused by major disagreements on the management of the negotiations. Now that an agreement has been reached and is likely to move forward, this failure will become water under the bridge. Although it will be politically difficult, the United States and Israel should come to a strategic agreement similar to the one reached between the United States and GCC states at Camp David. This framework need not be hashed out at a high-level summit but can instead be worked out by American and Israeli diplomats and defense officials. It should cover the same areas as the U.S.-GCC summit communiqué and annex, outlining the steps both Israel and the United States will take to counter Iran’s negative regional influence. As part of this framework, the United States should agree to provide Israel with additional capabilities necessary to fend off Iranian proxies. These capabilities—such as missile and rocket defense systems similar to the Iron Dome—should be funded as an addition to the current $3 billion per year in military assistance Israel receives from the United States. Regional partners can prevent aircraft and ships from IRGC-linked companies from entering their territories. These companies serve as the logistical enablers of the IRGC, transporting personnel, weapons, and cash in support of Iranian proxies around the region. While many IRGC-linked companies have been sanctioned by the United States, they still operate in the airspace and waters of America’s regional partners. For instance, Mahan Air—designated as an IRGC enabler by the U.S. Treasury Department—lists six GCC destinations on its website. Regional partners, particularly those where IRGC-tied companies operate, can crack down on these enablers and restrict their regional freedom of movement. Barring these companies from regional airports and seaports would hinder the IRGC’s ability to move personnel, equipment, and money around the region. Together, the United States and its regional partners should establish an intelligence fusion cell focused on Iran’s support for proxies and its other destabilizing behavior in the region. The main goal of this cell should be to develop a unified picture of Iran’s disruptive regional activities—such as fomenting instability inside GCC states and other American regional partners—to ensure that the United States and its regional partners all have the same overall picture of these activities. An expressed commitment to countering these aspects of Iran’s regional policy would go along way toward easing GCC apprehension over the potential effects of the nuclear deal. As a first priority, this cell should focus on mapping the logistical networks that allow Iran to support proxies around the region and determine their weak spots. When necessary, the United States should offer support to regional military action against Iranian proxies and components of the logistics network that supports them, such as Israeli strikes against Hezbollah arms shipments in Syria. Regional partners should take the bulk of the risk in deploying forces on the ground, while the United States should provide key support such as transportation and aerial supervision. These raids should be rare and only conducted on mutual agreement, when based on solid intelligence, and after a full risk assessment. With or without a nuclear agreement, Iran will continue to present a severe threat to the stability and security of the Middle East—primarily through its material and financial support of proxies across the region. The United States and its regional partners will confront this problem regardless and already should be preparing to counter Iran and its proxies. While it is unlikely that the policies outlined here will fully defeat Iran’s efforts in the region, they can constrain those efforts and impose higher costs on Tehran than it has previously paid. Equally important, countering Iran’s policy of regional destabilization offers the opportunity for the United States and its regional partners—from Israel to the GCC—to pull closer together after the strain caused by nuclear negotiations. Rather than indulging in unconstructive behavior, the United States and its partners can engage in a constructive effort to halt—or at least slow down—Iran’s destructive actions throughout the Middle East. Vigorous action to constrain Iran’s malign regional behavior offers the United States and its regional partners a fresh start—one they should take. Peter Juul is a Policy Analyst at the Center for American Progress. Brian Katulis is a Senior Fellow at the Center. Shlomo Brom is a Visiting Fellow at the Center and previously served as brigadier general in the Israel Defense Forces.